Davison, Scott A. Petitionary Prayer: A Philosophical Investigation. New York, NY: Oxford University Press, 2017, pp. 189, $75.00, hardback. Scott Davison is Professor of Philosophy at Morehead State University. His other writings on petitionary prayer appear in the Stanford Encyclopedia of Philosophy, The Oxford Handbook of Philosophical Theology, and The European Journal for Philosophy of Religion. This monograph is his first full-length treatment of the subject. Petitionary prayer is a practice which is central to Christian piety, yet, few Christians stop to ask, does prayer make a difference to God? One almost assumes that it does, or else prayer seems to be redundant. 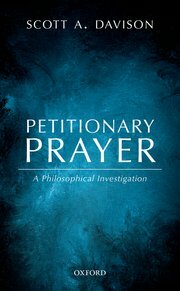 Scott Davison, in Petitionary Prayer: A Philosophical Investigation, poses this type of question as follows: “Assuming that the God of traditional theism exists, is it reasonable to think that God answers specific petitionary prayers? Or are those prayers pointless in the sense that they do not influence God’s action?” (p. 8). In attempting to answer this question, Davison refrains from interjecting his own religious beliefs and seeks instead to “write as a philosopher trying to be responsible for what we know from reason about metaphysics, epistemology, and value theory” (p. 4). He explains that he will defend his conclusions “by appealing to philosophical reasons that could be appreciated by anyone, reasons that do not require accepting the teachings of any specific religion,” yet at the same time he concedes that “specific religious doctrines are very important in connection with this topic” (p. 4). Although Davison himself does not divide the book into parts, Petitionary Prayer could be read as having four parts. Part one sets the framework necessary for tackling the question of petitionary prayer (chapters 1-2). Here Davison addresses what counts as answered prayers. According to him, answered prayers are those prayers which God actually brings about the thing that was requested. But what does it mean to say that God brought about the thing requested? Davison answers this question in chapter two. After finding Thomas Flint’s counterfactual account and Alexander Pruss’s omnirationality account wanting, he proposes what he calls the Contrastive Reason Account. According to this account a “petitionary prayer is answered by God if and only if God’s desire to provide the object of the prayer just because the petitioner requested it plays an essential role in a true contrastive explanation of God’s providing that object rather than not” (p. 163). With this account in hand Davison proceeds with part two. (1) E was caused by natural forces. (2) E was caused by some intelligent person who is not God. (3) God brought about E because someone else prayed for it. (4) God brought about E because S prayed for it. Even if (4) was the case, it seems as though, apart from direct revelation by God, S is not in a position to know which of these reasons explain E. S might correctly believe (4) but simply holding this true belief does not mean that S knows (4). According to Davison, the most reasonable thing to do in this case is to withhold belief as to whether or not E was an answer to S’s prayer. Regrettably, Davison does not avail himself to theological resources which can help overcome the agnosticism that results from this challenge. Davison should not be blamed for this given his self-imposed philosophical constraints. But what if he did make use of these resources? What options would be available to him? One option would be to say that God in fact often directly reveals that he has answered a particular prayer. Christians in charismatic traditions often report such experiences. But if one doubts that God commonly reveals himself in this way today, there are other ways around this challenge. Consider the following example. Dexter asks his friend Ed to buy him a burger. Ed walks away. Five minutes later, someone walks up to Dexter and says to him, “here is your burger.” What explains the appearance of a burger? Well the burger could have been purchased for Dexter by some other person, the burger could have been purchased for some other person and incorrectly delivered to Dexter, or Ed could have purchased the burger and had it sent to him. Dexter might correctly believe that this last option was in fact the case. But could he know this was the case? Surely the answer to this question depends on what one believes is required for a belief to count as knowledge. Let us assume, for the sake of argument, that knowledge is warranted true belief. Might it be the case that knowing that in the past Ed had promised to always buy burgers when asked warrants Dexter’s belief that Ed bought the burger? If one grants this, might it not be the case that knowing, because it is revealed in Scripture, that God has promised to answer all prayers for S, warrants belief in (4)? If one believes this, then perhaps one does not need to withhold belief about (4). In part three Davison shifts his attention from challenges towards defenses of petitionary prayers. Defenses, roughly speaking, concern arguments for why God would withhold certain goods from persons unless that person offers petitionary prayers (chapters 6-8). Here Davison critiques recent defenses of petitionary prayer including those offered by Richard Swinburne, Daniel and Frances Howard-Snyder, and Isaac Choi. However, his most significant contribution in this section is his development of The Autonomy Defense. Roughly, this defense claims that through petitionary prayer people authorize God to do things that otherwise might be inappropriate for God to do (p. 136). He further nuances this defense by making a distinction between “permission required goods” and “non-permission required good” (p. 138). The result is a plausible defense of petitionary prayer that fits both libertarian and compatibilist accounts of human freedom. Compatibilists will appreciate this, as compatibilist accounts of petitionary prayer have received little attention in philosophical literature. The final part of the book addresses various practical issues involved in petitionary prayer, the aims of prayer, prayer’s relation to faith, and thanksgiving. This book is a welcome contribution to philosophical discussions concerning petitionary prayer. Novices to the topic, including undergraduates, will find it helpful that Davison defines elementary concepts. They will also find it useful that he has cataloged many recent defenses and challenges to prayer. Readers who believe it is impossible to approach the topic from a purely philosophical angle will find his lack of engagement with theological sources frustrating. Nevertheless, anyone who reads this book will find something that stimulates further reflection on this perennially significant topic. I pray that this book gets the wide audience it deserves.